Often in the late spring I am asked “What are those big purple round flowers?” They are a type of allium, in the onion family, Allium giganteum. They are a bulb similar to a tulip or daffodil bulb that needs to be planted in the fall in order to come up in the spring. They are a hardy perennial bulb that does not need to be dug each year like a dahlia or gladiolus. There are several great purple varieties in addition to the A. giganteum including ‘Purple Sensation’, ‘Globemaster’, and ‘Gladiator’. There are also two white varieties ‘Graceful’ and ‘Mount Everest’. 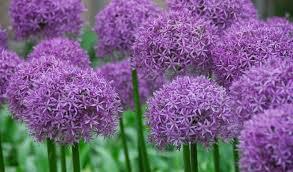 As well as two that resemble fireworks Allium christophii and Allium schubertii. Allium foliage come up first, before the flowers, and start to yellow before the flower has reached it’s full bloom. They are best planted in groups of 5 to 7 and mixed in with other taller foliage plants that will cover up their yellow leaves. They prefer a sunny site with well-drained soil. They make a great cut flower, and even the seed heads once the purple is gone make an interesting accent to the garden or dried flower arrangement. Hard to believe but, Think Spring!